Dissolved honey and brown sugar in water and added grape juice concentrate. Cut pears into thin slices to maximize surface area. Dissolved crushed Campden tablet and pectic enzyme in a small amount of water and stirred into honey water solution. Added pear slices to nylon mesh bag and placed in 2 gallon primary. Poured honey water solution over pears and pressed down on bag with a spoon to crush fruit. The must is delicious. Pressed bag of pears twice. By the second time, the fruit had completely disintegrated. Mixed ½ cup of the must with 1 cup water and added Champagne yeast. After 20 minutes, pitched the yeast starter into the primary. Airlock activity began about an hour later. Gas is slowly and steadily escaping through the airlock. Fermentation has slowed to a stop. Transferred to 1 gallon jug. 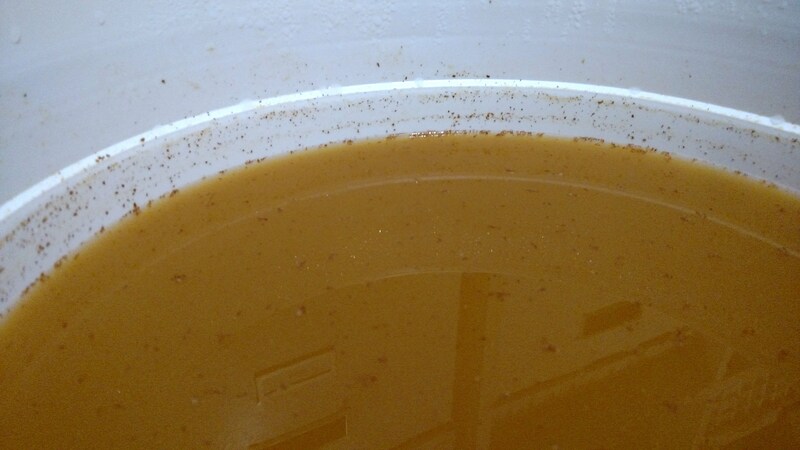 The mead has lost most of its flavor, though after adding sugar and acid to a sample, the flavor returns. Will need to adjust before bottling. Racked off lees and took a sample. pH was 3.85. Added 1¼ tsp acid blend to bring it down to 3.71. Heated up a small amount of Chardonnay and dissolved 1 tsp lysozyme and 1 crushed Campden tablet and stirred it into the mead. Topped off with more Chardonnay. Racked into fresh jug. Dissolved roughly 1/6 of 1/4 tsp sodium benzoate and 1 Campden tablet in 1/4 cup water and stored into mead. Back-sweeten with honey after a few days.